Aztec Dance Marathon is one of hundreds of Children’s Miracle Network Dance Marathon events that take place across the country (and Canada). Each of these dance marathon efforts benefit a local Children’s Miracle Network Hospital, this one being Rady Children’s of San Diego. The year long initiative comes to fruition at the overnight dance marathon where participants or,”dancers” are on their feet for 15 hours in honor of and celebration for the kids who cannot. They have raised over $120,000 for the hospital in just two years on campus, making them the highest fundraising philanthropic organization at SDSU. While the third annual official event is scheduled for February 2017, this week offered a series of events on campus promoting their mission, values, purpose, and encouraging students to join the movement. 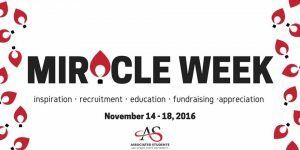 Miracle Week can be closely compared to a homecoming week of sorts. It was presented as a time to unify students under one cause. The week began with an inspiration day where members of ADM wore and distributed gold ribbons to celebrate awareness for childhood illness. With an initial goal of registering 250 new dancers and raising $10,000 throughout the entire week, they astonished the campus as the organization went above and beyond all expectations. On recruitment day the group managed to oversee over 1,000 participants who created an online fundraising page, pledging their commitment to collect funds and participate in the event this spring. Education day was a time to really get down to the core of dance marathon and the patients it serves. Members of the organization hosted an event in the Aztec Student Union with giveaways, music, and an opportunity for anyone interested to learn more information. This is the final thermometer posted from the Aztec Dance Marathon social media pages, although I’m sure a new total will be revealed at the end of the 24 hour mark. With the fourth day of Miracle Week: Fundraising Day rapidly approaching, fundraising chair Mackenzie Kahl was nervous about maintaining the momentum of the week throughout this “Push Day.” She confessed that the burden of reaching such an ambitious goal of “Five K in One Day” was weighing heavily on her, but she had faith in her team and the dancers they recruited. 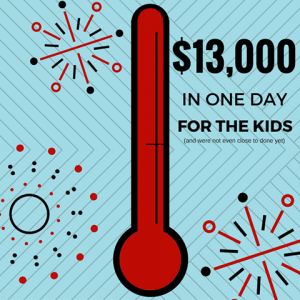 In one day alone…and really just about 12 hours, the organization raised an overwhelming $13,000. These thermometer posts were revealed throughout the day, keeping followers updated on the stance of their efforts. The overall goal of dance marathon is $101,000 and the final fundraising total will be revealed in the final hour of the overnight event on the morning of February 25th. There is still another day left in Miracle Week, focused on offering recognition and appreciation to registered dancers and everyone who has contributed to the cause. For more information about Aztec Dance Marathon, or if you want to contribute to the cause, feel free to visit their Facebook page or any of their other social media accounts. I was able to interview a reggae singer named Hirie. I went to one of her concerts and she was so energetic, uplifting, and I really enjoyed the show. Hirie is a nice, friendly, and positive being and she will be coming back to San Diego this year: Friday, May 20th, at 7:00 PM, at the Observatory North Park and on Saturday, June 18th, at 12:00 PM, at the Oyster Fest in 849 W Harbor Drive. Feel free to check out the interview below and be inspired more than you know. G: If you could tour to a remote place, where would you go? H: I would probably want to go to South America and just explore. We did a road trip down to Los Cabos. There are a lot of people in those areas, we ended up in a lot of villages, they don’t see a lot of people coming through. So, it was really cool just to hang out with the kids. We brought our instruments and exposed the villages to stuff that they haven’t heard. That’s kind of rewarding in itself. G: If you could only see in two colors what would it be? H: Blue kinda like the ocean, green could be grass or forestry and mountains. Those two are my most appealing colors when I’m trying to buy a dress. There’s nothing like a blue sky on a sunny day. G: Are there any talented musicians in your family and friends? H: Dad plays guitar, Grandpa plays flamenco and my Great Grandpa I believe, did the same. My mother, she plays guitar and she sings really well, and my sister plays the piano.Yeah, there is a lot of music in my family, whether they just enjoy it or they play an instrument, it’s something that we all enjoy. G: So singing was something you knew already and not something you learned along the way? H: I always enjoyed singing as a kid, I was in a lot of the school plays. I would emulate a lot of artists when I was little it was Whitney Houston and Celine Dion. I grew up with a lot of opera too, so I would always imitate Andrea Bocelli or similar types of Italian opera singers. It just came naturally to sing, whether I was technically correct at it, that took me a minute to learn, you know. I’ve always just sung for fun. G: When did you first join a band? H: I think I formally started my own band, it was just before the band Hirie when I met my sax player Chris who originally played the keys for me, we formed a band under my real name, and we did a couple of shows. Then at that point is when I put the album together and then formally started Hirie. It was an interesting process I’ve always tried to have somebody back me whether it was on the Cajon or on the guitar. 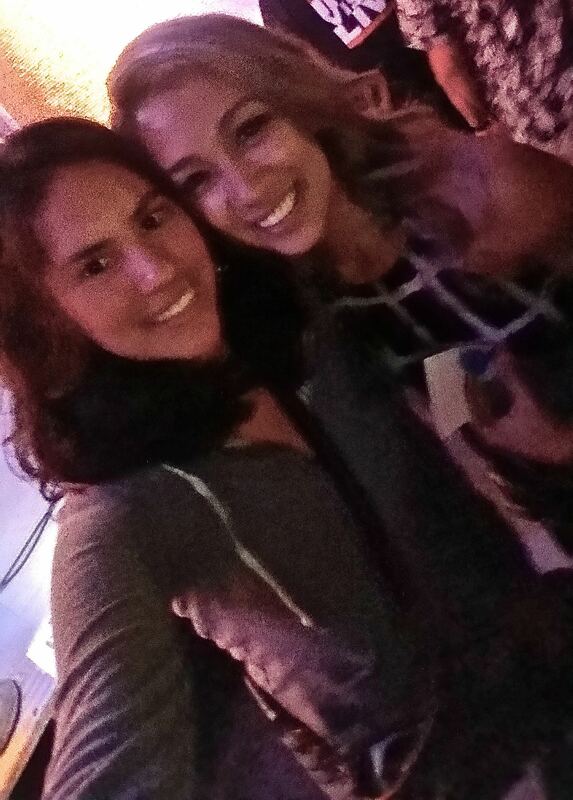 Even in high school, I had a friend who sang with me and she played the guitar with me and so, I played the guitar. But a real band was Hirie and that was 2 and a half years ago. G: If you could inspire a movement with your music what would it be? H: Definitely, to be kind. I feel that our society has a real issue with being mean or degrading. It is not like a lot of the music on the radio helps us be kind. It’s more take care of yourself; you know I am me and I am the only thing that matters kind of thing. I would love to just make people aware of the pain that happens in the world, and the suffering. Not necessarily highlighting on the suffering but giving people the kind of music that would inspire them to help other people, other animals, other things. You know, think not just of themselves but of everything that cannot speak for itself. G: If you could write a song about food, what type of food would it be? H: For me, It’s more of a process that I would write about such as, cooking. I love garlic, onion, olive oil, and coconut oil. I am trying to be more natural with my food; less process, less cooking, more raw. I would sing about the joy of cooking, preparing food and making food for people. I love preparing meals and having people who come over and enjoy it. G: What do you like using your music for? H: I like to write music to just explain things from a different point of view; to inspire and artists need things from a different angle or expression for growth. Some people have a hard time expressing themselves. I think sometimes they are able to express themselves through someone else’s music. You know especially for me when I see art or a painting on a wall it might trigger some emotion in me that I might have a hard time expressing. So, I might be able to better understand what I’m going through and how I feel through something else. I find it, in my case, it is nice to write music that might be able to help somebody else with whatever they are going through, to do something about the situation they are in. G: What is the biggest discovery that you’ve gained in life that made you who you are today? H: That’s very crucial. The biggest discovery is learning how to be a mother. That definitely changed me for good. It makes you think differently, it makes you more patient, more resilient and I waste less time on things that don’t matter. Bringing life into the world is a whole other thing it is such a life changing experience and you learn how to adapt. Bringing a human-being has been the most powerful discovery I’ve had. G: How do you balance your schedule, know what you don’t really need to do and know how to say no to yourself? H: I chose to not get distracted by things that don’t matter. The way that I gage what doesn’t matter is just whether it positively benefits me, my family, my career, my spirituality, my health. If its none of the above then I definitely put that down on my to-do list. Getting my nails done doesn’t really affect my family or my career. So I would pick songwriting for an hour versus going out and doing something that is a temporary materialistic need. Given one could argue that it puts them in a better mood but there’re other things I could prioritize like, maybe a date with a friend – and going to the beach. Going out would have the same effect on my body as doing my nails would. Not saying my nails aren’t done right now because they are. For me, it is important that I’m doing things that benefit not just myself but benefit other people. G: If you could have a business not related to music what would it be? H: I would want to teach, have a space for learning, whatever that would be or have a restaurant with a music venue inside it. I am a social person, I like to be around people. I like to learn from people and socialize. Just a job where I could help someone or understand something a little better or provide a space for people to learn and grow would be really cool for me. G: What are your top personal and career goals? H: To be a good person and be happy and spend less time doing things that are not important and be less materialistic. On the business side, just continue playing music and going on tours and traveling. G: What would blow your mind if it were to happen? H: A tour with Slightly Stoopid. G: What type of un-ordinary power would you have? H: Power to make people move out of the road so, I can drive without being blocked all the time. G: What places have you toured that you really enjoyed going to? H: I really like the East Coast because I have never been exposed to a culture like that. I have always been by the beach, by the mountains but all the way over there it is so cold. Yeah, I guess I have always been more on the Pacific side of things and it would be really cool to explore the East Coast more. I am definitely into the history, the older buildings, the weather and how it affects the way people live – like snowboarding and skiing. G: Would you ever join a show like the Voice or American Idol? H: No, I wouldn’t. I pride too much on being myself and on those you are molded into some form that they want and I’m just not down to do that. G: What do you like to do when you are not at work? H: Spend more time outdoors, being around people, or being alone with myself reading a book. Definitely, anything that would just enrich me; be helping other people for sure. But what I tend to have to do lately is work on Hirie stuff, on my laptop researching, connecting with people on emails, or phone calls; at rehearsals that’s been 12 hour days. What I secretly long to do is discovering more about myself because we are always changing and growing and learning. You need to allow yourself time to find a new better version of you or you’re just going to be stuck in your rotation and you might not be happy. G: What do you to help you relax from a busy life? H: Music makes me happy, listening to other music. Going to live concerts, going to the beach. Driving, being on the road, going on tour, flying, visiting other countries that I don’t understand. G: You tend to write chords before you write your lyrics but, do you ever just write something and you end up making a song out of it? H: I used to do that more and sometimes I will have a thought and write a song based on whatever I wrote down. But I do tend to jam out to some chord progressions and then write music that way. It is not to say that I don’t get inspired by something I wrote down. G: What inspires you when you write music? H: Everyday experiences, emotions, something somebody else might be going through, how that made me feel and how inclined I was to base a story off of them. Nature inspires me, violence, commosity, anything and everything. G: What would you do to change the world? H: Be kind, inspire happiness and positivity in the world definitely makes good things happen. The nicer you are to somebody else, the nicer they might be to the next person, and I just believe in karma and sparking something like that. G: You have a busy lifestyle, do you ever get stressed out? how do you maintain the positivity while you are on tour? H: You get stressed out, you get sick, you get worried, you get anxiety, you get depressed, I get all those things like anybody else. I deal with it in different ways depending on my diet, if I am eating really fast I might feel worse because I am bloated and I am in the corner moping. If I am eating healthy and I am working out it might be easier to shrug off something that would typically really upset me. It is just how you take care of yourself and how aware you are that you have an issue. If you just kind of ignore it, it is going to fester and it is going to multiply into something really bad. If you are good to yourself, to your body, and everybody around you, it is easier to maintain sanity along the road. G: What did you use to want to be, when you were younger? H: I used to want to be a psychologist: to help people with their problems, listen to them, and give them the space to express themselves. I always lent an ear to my friends and family. I took pride in being able to provide confidentiality like that and help relieve tension. G: What books do you like to read? H: World War II books, mythology, conspiracies. G: What is something that nobody would expect from you? H: That is a hard one, I don’t know what people would not expect. I do not know what people think, to be honest. I am really sarcastic. I feel like I can be really nice but I can be sarcastic. I think that is something that people don’t know. Even with band members, a lot of them come and go, when they get to know me it is a different experience than when they first met me. I tend to put on more of a facade where I am really nice but once I get to know you I find it okay to make jokes and throw jabs here and there. I can be kind of a boy and a lot of people don’t expect me to be as rough as I am. G: What makes you laugh? H: Everything makes me laugh, I am not a serious person. It’s a KCR College Radio giveaway! 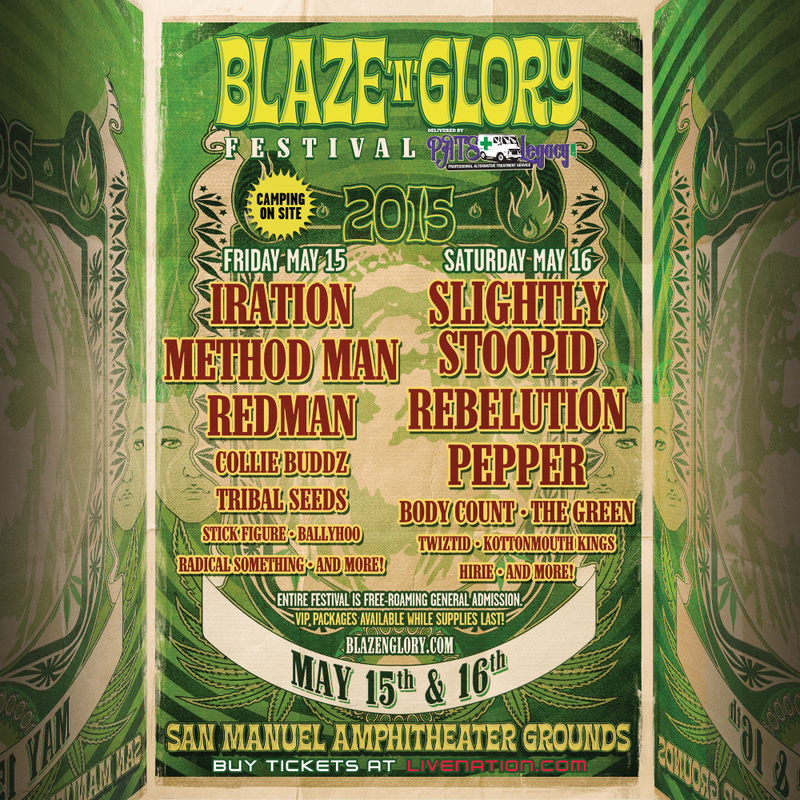 The Blaze N Glory Festival will be making its debut in San Bernadino, Calif., this May 15 to 16! The festival will feature Slightly Stoopid, Rebelution, Iration, Method Mad and tonnes of other artists alongside a vendor village, carnival rides and many more! 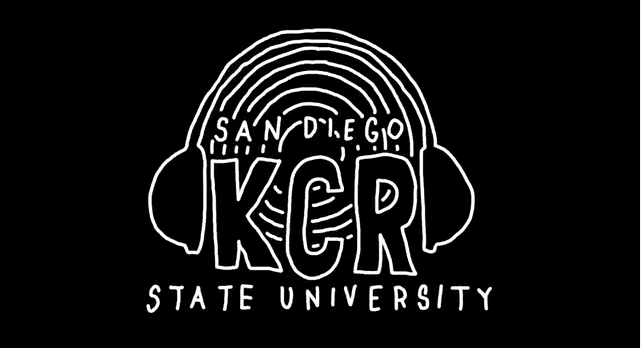 KCR College Radio has passes to give away and here’s how you can get your hands on a pair! Follow us on Instagram at @KCRCollegeRadio! Follow us on Instagram @KCRCollegeRadio!